Status and trends: Bluenose West herd size was estimated at 15,268 ± 1,369 caribou in July 2015 (Davison, T., pers. comm. 2016). Numbers likely peaked in 1992, based on an estimated 112,360 (± 25,566 95% CI) caribou, then declined before stabilizing at about 18,000 to 20,000 caribou between 2005 and 2012 (Davison 2014). The overall decline is an 87% reduction between 1992 and 2015. Ecology: The Bluenose West herd calves and summers on the coastal tundra and winters in the boreal forest . Most of the current calving grounds are within Tuktut Nogait National Park. The tundra is relatively narrow compared to east of Bluenose Lake and a higher percentage of the annual range is south of the treeline. Habitat trends in forest fires, climate and land use activities are currently unreported. There have been concerns about seismic and other exploration for oil and gas on the herd’s winter range. Trends in predators include relatively high sighting rates of grizzly bears on the calving grounds (Poole et al. 2013). Hunters have reported larger wolf packs (Davison 2014). 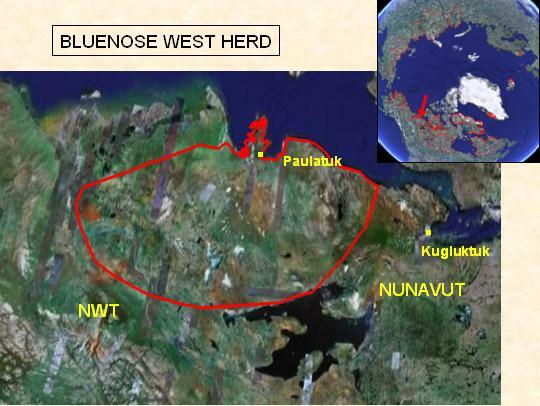 The Bluenose West herd is primarily harvested by Inuvialuit, Gwich’in, and Sahtú Dene and Metis in Aklavik, Colville Lake, Deline, Fort Good Hope, Fort McPherson, Norman Wells, Inuvik, Paulatuk, Sachs Harbour, Tsiigehtchic, Tulìt’a, Tuktoyaktuk, and Ulukhaktok. Climate: The climate for the Bluenose West calving and summer ranges is average compared to more western and eastern herds although the summer range is both cooler and has more rainfall than the Bluenose East and consequently, has a lower drought index. The winter ranges are relatively cold with less snow and fewer Rain-On-Snow or freezing rain days. Only the number of plant Growing Degree Days in early June shows a significant increase (1979-2016). Severe events include fall freezing rain and icing in fall 2003 which led to unusual caribou movements (Nagy et al. 2005) . Monitoring: Trends in herd abundance are monitored through post-calving photography and demographic monitoring is limited: mid to late June calf ratios for the Bluenose West herd were low in 2000 and higher in 2001-08 but are not reported subsequently. Late winter calf:cow ratios have been only irregularly surveyed (Davison 2014): the ratio was >30 calves:100 cows in 2000, 2008, 2009 and 2011 but low in 2007 (26 calves:100 cows). Inuvialuit, Gwich’in, and Sahtú harvest studies which covered years between 1988 and 2003 and the average annual harvest totalled 5782 caribou but was not assigned by herd. In 2005, ENR (2007) estimated the harvest was 900-1200 caribou (5-7% of the 2006 herd estimate). Management: Mechanisms for the 1992-2015 decline are uncertain but harvest and predation may have combined to accelerate the decline. The Sahtu Renewable Resource Board, Gwich'in Renewable Resource Board and the Wildlife Management Advisory Council (NWT) are the responsible co-management boards and work with the Government of Northwest Territories. The co-management board’s 2005 and 2006 recommendations led to closing of non-aboriginal hunting and setting a Total Allowable Harvest at 4% (712 caribou) in 2007/08, with recommendation that the harvest be 80% bulls (Davison 2014). Nagy, J.A., W.H. Wright, T.M. Slack, and A.M. Veitch. 2005. Seasonal ranges of the Cape Bathurst, Bluenose-West, and Bluenose-East Barren-ground Caribou herds. Department of Environment and Natural Resources, Government of the Northwest Territories. Manuscript Report No. 167. 44 pp. Poole, K.G., A. Gunn, and J. Wierzchowski. 2013. An operations guide to barren-ground caribou calving ground density, dispersion and distribution surveys, based on an assessment of the June 2007 and 2008 Surveys, Northwest Territories and Nunavut. Department of Environment and Natural Resources, Government of the Northwest Territories. Yellowknife, NWT. Manuscript Report No. 226. 89 pp.